Calcium is the most abundant, essential mineral in the human body. Of the two to three pounds of calcium contained in the average body, 99% is located in the bones and teeth. Calcium is needed for the formation of bones and teeth and is also required for blood clotting, transmission of signals in nerve cells, and muscle contractions. The importance of calcium for preventing Osteoporosisis probably its most well-known role. Calcium Citrate, a premium form of calcium in Ultra Calcium™ is the chief ingredient. This compound is readily absorbed into the human body thus, maximizing its beneficial effects on our body system. 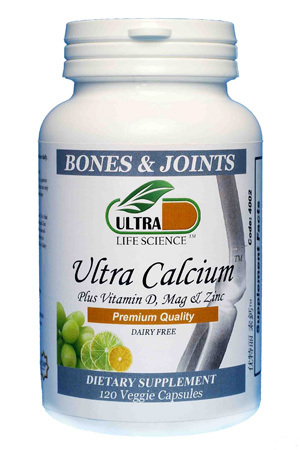 Ultra Calcium™ also contains Vitamin D, Magnesium and Zinc which helps to enhance the proper absorption of calcium. The magnesium and zinc minerals are made in the form of gluconate for high bioavailability. Ultra Calcium™ is suitable for anybody ranging from children to elderly, especially for people with lactose intolerance as it does not contain dairy products. Ultra CalciumTM is also enriched with Soy powder and Ginger root extract to enhance its beneficial health effects. healthy bones, teeth and nails. Zinc, Fluoride and Phosphorus which enhances calcium absorption. cramps and other calcium deficiency symptoms. ♦ May help in improving sleeping pattern. menopausal women and elderly people. osteoporosis, arthritis and bone fractures. often experience cramps, insomnia, backaches or body aches. diets, heavy smokers or heavy drinkers. Calcium is extremely important for the development of bones and teeth in the young. Adequate calcium is also needed for pregnant and lactating mothers so as to supply sufficient calcium to the fetus for growth and formation of strong bones. Osteoporosis is a condition which is caused by calcium deficiency that involves loss of calcium from the bones and reduced bone density. Osteoporosis is a “silent crippler” because people may not know they have it until a fracture or fractures occur. Women require supplementation of calcium to protect them from calcium deficiency conditions after menopause as a drop in estrogen would mean decreased calcium absorption thus increasing the risk of osteoporosis. Due to decrease physiological functions in the elderly which slows down their ability to absorb nutrients and metabolism, elderly should also take calcium supplements to reduce the risks of osteoporosis and bone fractures. People with vitamin D deficiency conditions like pancreatic insufficiency may develop a deficiency of calcium as well. Vegans, people with dark skin, and people who stay indoors most of the time are more likely to be vitamin D deficient. Most people eat well below the recommended amount of calcium. This lack of dietary calcium is thought to contribute to the risk of osteoporosis, particularly in white and Asian women. Vitamin D increases calcium absorption in the intestine. Calcitriol, the active form of vitamin D, increases the production of calcium-binding proteins in the lining of the small intestine. The rate of calcium absorption seems to be directly proportional to the quantity of calcium-binding proteins. Therefore, adequate vitamin D is essential to maintain healthy strong bones. Magnesium is an essential mineral needed by the body. It is needed for bone, protein, fatty acid and new cell formation, activating B vitamins, relaxing muscles, clotting blood, and forming adenosine triphosphate (ATP; the energy the body runs on). Zinc is an essential mineral that is needed to repair wounds, maintain fertility in adults and growth in children, synthesize protein, help cell reproduction, enhance vision, boost immunity, and protect against free radicals, among other functions. Soy beans are widely known for their high protein content, which includes all essential amino acids. They are also a rich source of calcium, iron, zinc, phosphorus, magnesium, B-vitamins, omega-3 fatty acids and fiber. Soy also helps to conserve the body’s calcium stores. It contains isoflavones which may actually inhibit the breakdown of bones. Research found that there was a significant increase in bone density in subjects who consumed soy as compared to those who were given casein or non-fat dry milk powder. Isoflavones may have anti-cancer properties too. Several scientific studies have shown that a regular intake of soy may help to prevent breast cancer, prostate cancer and colon cancer by inhibiting the growth of existing tumor cells. The genistein in soy is also beneficial for women who have experienced menopause as it is a natural plant hormone in the form of phytoestrogen to prevent heart diseases. Hence, consumption of soy is beneficial to reduce blood clotting, plaque formation and cholesterol oxidation. Reduces the levels of LDL cholesterol in the body. Possesses anti-inflammatory properties that can help with arthritis. Fights off and alleviate the symptoms of colds and flu, as it possesses immunity-boosting abilities.